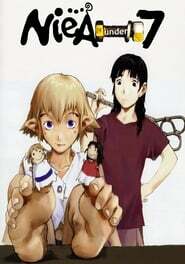 NieA_7, also known as NieA under 7, is a 13 episode anime series about Mayuko. A poor, introverted student who lives above a Japanese bathhouse, and NieA, a freeloading. Freewheeling alien who lives in her closet and eats her food. The series touches lightly upon issues of discrimination, stereotypes, alienation, city life vs small town life, and assimilation. Mayuko, who attends a cram school. Is a young girl living away from her family and expresses a lot of melancholy. NieA, who is apparently placed in an inferior class by her fellow aliens due to being a physical minority among them. Immediately accuses anyone who calls her a “stupid no-antenna” or the like, of discrimination. Other aliens adopt various stereotypical cultural styles, one chooses Indian dress and opens a convenience store, another chooses to associate herself with the Chinese Revolution.